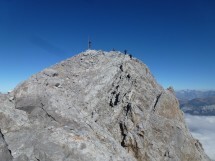 For Sunday, September 11, ( if the weather is nice) we (Jean Gomez and I) decided to organize a combined hike to Pointe Percée 2750 m. This famous and prestigious summit is the highest of Aravis chain. We start from Col des Annes (Clusaz) 1710 m. Most the route is rocky. The 2 groupes leave Gaillard and walk together until Le Refuge de Gramusset 2164 m. After this point I take 5-6 peoples to go up to Col Des Verts and through des chimneys arrive at the top. All other participants go up via normal way. At the summit we take our lunch and descend together by normal way. Elevation gain:1050 m. For experimented and sporty hikers. The hike is organised by the small hiking association Oxygene 74 http://rando-74.assoc.pagespro-orange.fr.